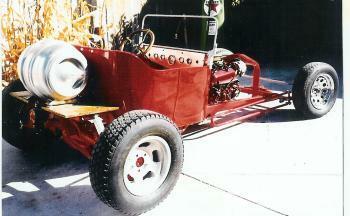 Radiator shell 1919-1923 Model T bucket. 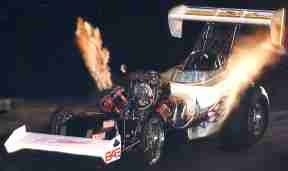 For replacement of original metal shell or for 'cover' over open radiator to meet dragster rules. 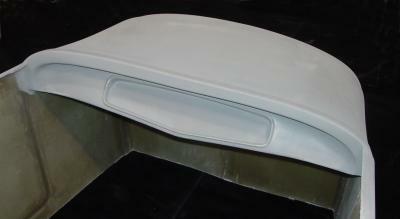 Made from durable hand laid fiberglass and can be painted to match car. Bottom edge has flange for attaching to frame. This turtle deck has front mounting flanges for easy attachment to body and is a one piece unit that does not open and close. Original body line of trunk opening is retained for the stock look or cut to open. This is a street type radiator shell that is extra wide for a larger radiator. Dimensions are 24 inches tall and 20 inches wide with a depth of 6 inches. This shell is made of triple thick hand laid fiberglass. Medium size pick-up bed. Has open back for mounting tailgate. Tailgate must be purchased separately. Full mounting flange for proper attachment to body. Features hand laid construction for durability and strength. 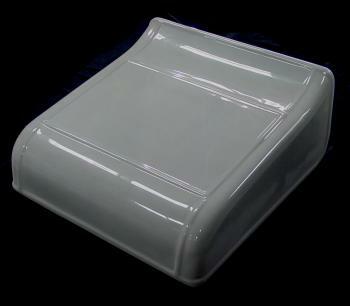 Outside width at upper flange: 45"
Can be used on the Street or strip. Made with 3 layers of hand laid fiberglass, this T-body is channeled to slip over drag racing chassis rails or it can go on top of rails for street use. Doors are integrated and are non-functional. Dash is flat for mounting any configuration of gauges. Firewall is flat for cutting to desired configuration. The over all length is 47-1/2". Width at bottom is 33 inches. Bottom "opening" length is 37-1/4 inches. Inside drivers width 42 inches. 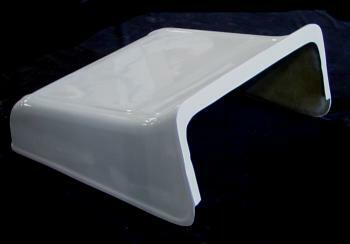 This is the tailgate for the T102 bed; it can be mounted permanently to the bed or it can be easily hinged. Ford imprint is raised and clearly visible. Firewall to wheel well 39-1/2". Height from bottom (at frame rail) to wheel well 25". NHRA legal for Comp and Super Comp classes. Body and tail section have wheel wells opened up for 33" tires. Actual wheel well size is 38". Firewall is 20" high, 24-1/2" wide. Rear view of TA-301, T-Altered Body. TA-304 is designed to be attached to the rear of this unit. Made of medium weight hand laid fiberglass, it will withstand heavy use in drag racing. This AA/FA Features Unlimited's T-Altered Body. Owner driver Mike Sullivan. Sponsored by Consolidated Packaging. This new car was built for match racing, as there is still no true fuel altered class for today's hard charging 5.50 second 270 mph AA/FA. This dragster features a 5,000 hp nitro (90% nitro / 10% alcohol) engine. Runs 5.50 seconds in the 1/4. Rear section of TA-301. Attaches to TA-301 by bolting or "glassing". Smooth gel coat finish. 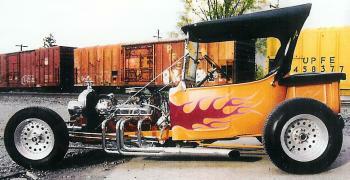 Length of front section 19"
T- nose (20" long) 20-3/4 wide x 8-3/4 high. Made of hand laid fiberglass. Built in contoured dash for that stock look. Doors do not open. Firewall has 'tunnel cut'. Made from double thick hand-laid fiberglass construction. Smooth grey gel coat surface for easy painting. Width at bottom is 30 inches. Flange is on bottom for mounting on top of rails, or can be mounted over rails if desired. Firewall width is 27-3/4 inches. Width between notches in front is 26-3/4 (notch is 3-1/2 above base flange). Notches can be widened to 27-3/4 at firewall. Width between notches in rear is 30 inches and notch is 9-1/4 above base flange. Length at notches is 46-3/4 inches. Firewall to rear is 48" (at top of firewall). Universal front nose for Junior dragster. 19" long x 10" wide x 5-1/2 high. 30" long x 21-1/4 wide x 9" high. Can be dzus'ed on or bolted to frame. Made of medium weight hand laid fiberglass. 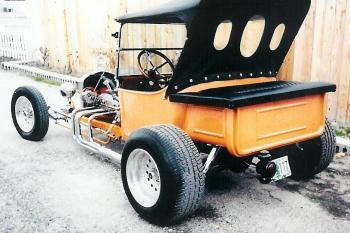 Model-T pickup bed and tailgate combo. Tailgate is built in. Overall length is 16" long. Can be bolted or bonded to body. Features full mounting flange for easy assembly. This is a replica of the famous Auburn style dash board. Made of hand-laid fiberglass to help support your gauges. "Gauges not included". This dash fits the T-227 1927 T roadster body. This shell combines the radiator grill shell and the head lights in one smooth piece. Mounts to the front of the radiator with the molded in flange. This grill shell comes already notched for the steering shaft, but no fill cap hole is provided, this area is left blank, but can be cut open for a filler cap if desired. Front opening is 15-3/4" wide and 13-3/4" high. The bottom is relieved to accept a taller (20" or more) radiator if desired. 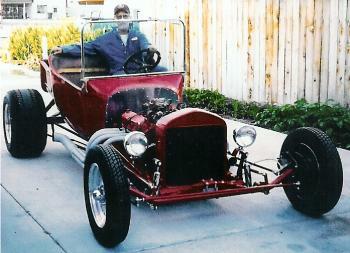 Now you can build a 1926-1927 T Roadster at an affordable price. Made of durable hand-laid triple layer fiberglass, this body will out last steel because it will not rust. Doors are integrated and are non-functional. No floor is included and must be fabricated. 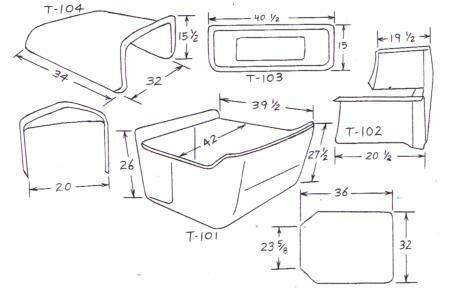 For dash, order part number T-803 (auburn dash). For additional charge, we can 'glass the dash in. Model T227 is for street roadster and has extra reinforcement to all large flat areas for increased thickness, rigidity and strength. 23-1/2" high x 90" long. 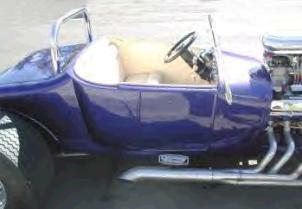 Fits on frame rails: 28-1/2"
Distance of cockpit from firewall: 17"
T-227D Same as T-227 but has Auburn dash built in. Copyright � 2014 Unlimited Products. All rights reserved.